Fairly standard Nicholsons that I wandered into by mistake, meaning to go to the Good Beer Guide Shakespeare in Summer Row! Seen it done a thousand times but decent beer and comfortable environment. 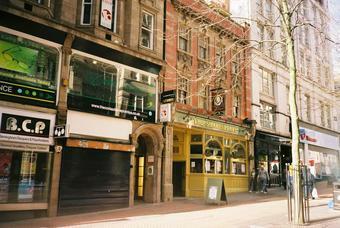 A very good pub in Birmingham's centre. 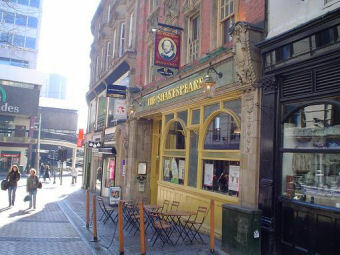 Along with the nearby Trocadero the Shakespeare epitomises what city centre pubs should be: comfortable environment, reasonable prices and good service. In my limited experience (perhaps 6 visits over 4 years, all in daylight) it has ranged between moderately crowded to rammed yet there has always been quick service & a nook to perch in. This visit I enjoyed a pint of Doom Bar (3.30) and pondered the ubiquity of that brand. Being so close to New Street station, this pub will invariably attract its fare mix of people who often won't stay long. Unfortunately some of the bar staff encourage the transience by offering poor service. On arrival, I was expecting the female member of staff to approach me to dispense a beer. Instead, she continued talking to a couple of others further up the bar and completely blanked me. Eventually after a few minutes waiting with nobody else at the bar, another member of staff appeared from collecting glasses and offered service. This practice will never encourage repeat visitors. The pub itself is fairly nice. It's a Nicholsons, but not as good as the other Nicholsons on Summer Row (also the Shakespeare). About half of the pumpclips were turned around with only Roosters Astro, Stroud Organic Ale & Purity Ubu on offer. Surprisingly for a Nicholsons, they also stocked a real cider - Westons Old Rosie. One plus point to help recover an otherwise disappointing experience. Mcroyal and Odin are spot on...mind the missus reckons the ladies lavs which open straight onto the stairs could be a bit precarious if too much vino or vod had been consumed. Reasonable pub, if a little dull. Beer good and leather chairs very comfy.